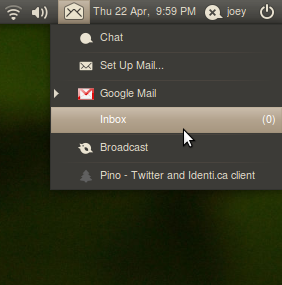 GMail Notifier puts GMail in your Messaging Menu - OMG! Ubuntu! Further to our previous post on integrating Thunderbird with the Messaging Menu it struck me that many users – such as myself – don’t use a desktop e-mail client at all. Below are two very similar applications that integrate your GMail account inside the messaging menu – complete with menu entry, notify-osd ‘bubbles’ and even ‘green envelope’ alerts on new mail. Sadly neither of these are included in the Ubuntu repositories but one can easily add and install them via the their respective PPA’s. GM-Notify is the first one and the only major difference between this and the next is that it doesn’t list your unread e-mails in the messaging applet, instead it simply displays the number of unread items in your inbox. To set up your GMail account with GMail Notifier head to System > Preferences > GMail Notifier Configuration. From here you can also specify alert sounds, labels and on-launch preferences. The second �” and again pretty much identical �” version does all of the above but with the addition of listing the unread items waiting in your inbox (see picture).